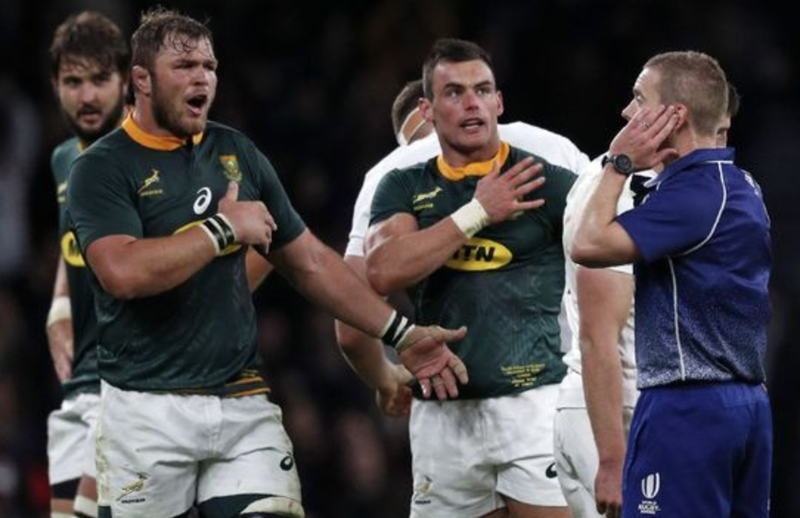 Angus Gardner has told Sky Sports he was wrong not to penalise Owen Farrell for his shoulder-led tackle on Andre Esterhuizen at the end of England's Test against South Africa. Gardner was the subject of fiery debate around Farrell's last-gasp tackle, which the Australian deemed legal at the time, as it robbed the South Africans of a chance to kick a penalty that could have clinched victory. Speaking at the World Rugby Awards in Monaco, during which Gardner was crowned referee of the year, the 34-year-old said if he could turn back the clock, he would change his decision. "I think in hindsight now, having discussed it with some other referees... I think the general consensus would be that a penalty was probably the outcome there that should have been given." "I think we need to see a wrap with both arms, and I think in hindsight - although he got pinned - there wasn't a big enough wrap from both arms, really. There was a wrap with one arm, but there wasn't a wrap with the other arm." Asked why he saw it different on November 3, Gardner replied: "The angles that I saw with the TMO, which were the head-on angles, showed a clear wrap of the front arm, but it was the back arm which got pinned. "Of the angles that I was showed in the stadium at the time, that seemed to me to be enough of a wrap for me to constitute a legal tackle. "It was never high, and so all we were looking at was the tackle technique. The collision itself also kind of swayed my decision because it was a big rugby collision, and we see these hits in the game." Gardner says he is aware that referees will sometimes impact Test matches with their decisions, but says they are always aiming to get better, and that an honest approach in reviewing his games will aid his development as an official. "We don't always get it right, and we understand that there are going to be decisions that are going to heavily influence the game," Gardner said. "At this level the expectation is that we do get it right - and that's what we're striving to achieve - but we don't always. "I suppose that's the best way, just to be honest about it. If I made a mistake, I've got to put my hand up and say I was wrong, and hopefully if I see that again then I'll know where I'm heading."